CHICAGO – Except for the clear purpose of cashing in on yet another “Godzilla” remake, everything is happening for no reason. Worst of all, what is ensuing misses and even mocks the reason why Ishirô Honda originated 1954’s “Godzilla” in the first place. Since then, times have dramatically changed and blockbuster Hollywood movies have a new boss to answer to: the box office. Still, we can’t forgive a film that focuses on CGI and big-city destruction while assuming we don’t care about a story and the honesty of where that plot needs to have its roots. The original “Godzilla” is an understandable outpouring from Japan when it was suffering in real life. America isn’t traumatized here. A scene from 2014’s “Godzilla”. It’s insulting to audiences to think the eye-candy fed to the two holes above our nose is more important than the brain that sits atop our head. Our minds have to be equally satisfied. Whether or not you’re a longtime “Godzilla” purist who wants each incarnation to have some of its original authenticity, it’s just too easy to fault Gareth Edwards’ 2014 version for what this film isn’t. “Godzilla” is a “kaiju” (a “strange creature” in Japanese) that refers to a genre of “tokusatsu” entertainment (Japanese special effects). Ishirô Honda’s intention was to signal a loud warning about the dangers of nuclear bomb testing at the Bikini Islands in 1954. His response was his 1954 “Godzilla” film, which was designed to shed light on the dangers of atomic warfare so they’d be convinced to cease production. 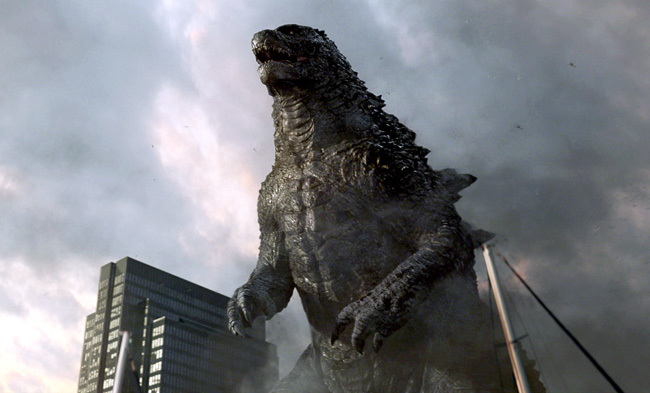 Edwards’ 2014 version of “Godzilla” – from Warner Bros. Pictures and Legendary Pictures (which brought us “The Dark Knight”) – is the 30th Godzilla movie made. Towering over large skyscrapers, Godzilla is unsurprisingly even bigger than we’ve seen him before. A previous American version was made in 1998 by TriStar Pictures starring Matthew Broderick from director Roland Emmerich. But before these two American films, Japan has been all about Godzilla – having released an incredible 28 Godzilla films all produced by one Japanese studio: Toho Studios. 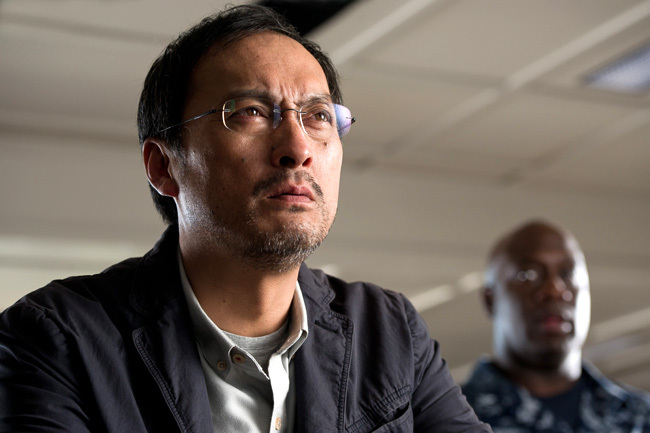 Ken Watanabe in 2014’s “Godzilla”. Interestingly, Godzilla is to Japan very much like James Bond is to the United Kingdom. With nearly the same amount of movies and originating around the same time period from a single studio, there have been 25 James Bond films since 1953. Only two of them weren’t made by Eon Productions. Now while Godzilla has unquestionably succeeded as a global franchise phenomenon from a financial perspective, much of what we’ve seen since Honda’s 1954 film has been a large departure from the creature’s roots. As the primary Japanese actor in the 2014 American film, Ken Watanabe as Dr. Ichiro Serizawa is the only one who remembers Honda’s original spirit and warns against using nuclear weapons. Aside from Watanabe, our Hollywood stars in this film are forgettable. But even Watanabe’s fears are overlooked by a film whose primary mission is to pit huge monsters against each other with a weak understanding of why they’re fighting. Sure, Godzilla and the M.U.T.O.s have hated each other for a long time and now must fight it out. It’s like two parents who have bottled-up angst and they’re getting divorced to create theatrical drama instead of going to therapy to work it out. In the end, the primary reason is to show off Hollywood’s CGI advances. Yes, Godzilla looks amazing, but that’s not enough any more. Lacking substance and truth from its origins, this “Godzilla” feels very “Transformers” and Michael Bay-esque with its addiction to being big, loud and expensive. Understandably, 2014’s version doesn’t have to be 1954’s original and it’s not trying to be. The fear that was nuclear then has transformed into a different one now: climate change. But while being something new, it still must be able to stand by itself with its own plot progression, consistent pacing, enemies who serve a purpose and heroes you want to root for. Even if you throw away all 29 previous films and pretend this one debuted Godzilla to the world for the very first time, Gareth Edwards’ film has gaping and unforgivable holes. Aaron Taylor-Johnson (left) and Elizabeth Olsen in 2014’s “Godzilla”. While understandably needing it these days, Godzilla isn’t and shouldn’t be about CGI. Without a cohesive story that’s based in the originator’s roots, we’re left with an inauthentic film that only has a few crowd-pleasing, Godzilla-killing moments. And even Godzilla’s own screen time is shockingly sparse. Godzilla is supposed to be our hero. If we are going to primarily brush aside the nuclear fear, at least we could go to an emotional place like getting to know Godzilla himself. We do in very brief moments. I want to understand him, but we just scratch the surface of starting to feel his loneliness. We need more from inside his huge head and his intentions to truly get behind him as our savior. All the “restoring nature’s balance” dialogue is filler to excuse the fact that he’s really just awakened to ward off whatever monstrous enemy of the day decides to attack humanity. In this case, we have a boy and a girl M.U.T.O. – dragon-like monsters – who don’t have a well-explained qualm with Godzilla. All the while, humans are but pointless ants in the mix who have no choice but to watch the ensuing destruction. All the bullets and missiles and fighter jets and tanks we throw at these creatures bounce off them like throwing cotton balls at a grown man. AS scene from 2014’s “Godzilla”. Godzilla’s enemies even mock Honda. Instead of warning against nuclear weapons, the M.U.T.O.s decide the bombs are tasty and they enjoy eating them for dinner. Now on an interesting tangent, they bring back a concept we remember in 2001’s “Ocean’s Eleven”: the EMP. Then a non-nuclear Electromagnetic Pulse, that EMP was placed in a van to shut down the electrical power to Las Vegas so they can rob a casino without security. The M.U.T.O.s have the same power, but for dramatic effect, they randomly decide to kill electricity so fighter jets fall out of the sky, trains stop, mobile phones shut off and radar goes dark. But why? These Massive Unidentified Terrestrial Organisms – one is ground based and one is airborne – aren’t threatened by people. Clearly the only reason they’re EMPing us is for special effect. The film reveals its true purpose – which ultimately is its lack thereof – when Watanabe says we should just sit back, do nothing and let the monsters fight each other. Our government, of course, can’t do that and must attack for national security purposes, which is code for Hollywood’s excuse to capitalize on Japan’s biggest hero. “Godzilla” stars Elizabeth Olsen, Aaron Taylor-Johnson, Ken Watanabe, Bryan Cranston, Sally Hawkins, Juliette Binoche, David Strathairn, Patrick Sabongui, Victor Rasuk, Richard T. Jones, Carson Bolde and CJ Adams from director Gareth Edwards and writers Max Borenstein and Dave Callaham. The film is rated “PG-13” for intense sequences of destruction, mayhem and creature violence. It opened on May 16, 2014 and has a run time of 123 minutes. Submitted by David Mackay Ballard (not verified) on May 17, 2014 - 2:54pm. You really weren’t paying attention to the story, were you? Godzilla was not attacking them for no apparent reason; it was explained that these two creatures were ancient adversaries from the earliest days of the planet and that they that bore a stong hatred for each other; the existence of the M.U.T.O.s actually threatened Godzilla’s existence. You’re well entitled to your opinion and I respect you for it, but it’s slightly irresponsible to dismiss the storyline if you missed a key element of it. But why do they hate each other? Submitted by HollywoodChicago.com on May 17, 2014 - 3:25pm. It’s easy to fashion together false enemies today by saying they’ve hated each other for a long time. But why have they hated each other for a long time and why duke it out now? Just they’ve been sucking up energy for 15 years and now it’s time to release? Come on. For some, it’s fine to not question purpose. For me, it’s not good enough to put two forces in a movie and tell me they hate each other while asking me to shut off my brain and enjoy watching them fight. Submitted by *rubs eyes* (not verified) on May 17, 2014 - 3:58pm. oh wow, you really are dense, aren’t you? > But why have they hated each other for a long time and why duke it out now? mating cycles! do you need encyclopedic knowledge of apex predators over earth’s earlier periods to justify 1 mating couple fighting an extremely territorial predator? NO! the audience is fine without a dissertation from a biologist! Submitted by HollywoodChicago.com on May 17, 2014 - 4:04pm. Let’s think about Jurassic Park. Spielberg and Crichton took the time to explain the science. It was the most fascinating part of the film, and with that understanding, it was easy to fall in love with it. You can’t assume people know these things. You also can’t assume they don’t care. As a filmmaker, it’s your responsibility to sell it, and part of that is explaining it. Submitted by *rubs eyes* (not verified) on May 17, 2014 - 4:20pm. because a large organism living in hibernation in the earth’s mantle for millions of years is less believable than extracting DNA from amber in petrified rock? yeah i’d say they’re about the same. i don’t believe connecting every dot for the audience, if they’re too dumb to figure out why a mating couple of top predators would fight over a nest with a super territorial competing organism, maybe its time to revisit 4th grade science? Submitted by Brad Hallston (not verified) on May 19, 2014 - 12:27am. I’d say the DNA in the amber is far more believable. Submitted by *rubs eyes* (not verified) on May 17, 2014 - 4:28pm. Submitted by HollywoodChicago.com on May 17, 2014 - 4:34pm. That’s a campy and cheesy scene in Jurassic Park, but yes, precisely. It explains things and propels the fictional story into a believable understanding you can get behind. Submitted by David Mackay Ballard (not verified) on May 17, 2014 - 4:24pm. I get your point. Seriously, I do - and to an extent, I was a bit disappointed myself because the film trailers promised a more weighty (pardon the pun ;-) version of the big fella this time ‘round. I have read further expositions from he filmmakers that sheds more light on this matter (because I have no life, some cruel folk would say); apparently, the M.U.T.O.s(a truly annoying term…but I digress…) would attack Godzilla and his kin, laying or injecting eggs into them a/la Giger’s Alien - a practice the big lizard folk weren’t too fond of. Some such rubbish along those lines. Hence the animosity between the two species. The obvious response to this is “then the filmmakers failed to include that info and so failed to deliver a coherent story”. Partially true; they did explain the enemies bit, and probably thought it would satisfy the vast majority of viewers (who, to be fair, probably couldn’t give a rodent’s behind about it.). Or (more likely scenario), the explanation ended up on the cutting room floor by executive decree to shorten the run time. In any event, I grant that this could have been a smarter script featuring more well-rounded characters, and I hate to fall back on the old tired response of “It’s a Godzilla film, not King Lear”, but… it is what it is. You can either enjoy these films for what the are - vehicles for big nasties to beat the bejesus out of each other - or you can tear your hair out opining for deeper fare and greater meaning that will never come. Personally, the film was worthwhile for the last sequence alone. I have always loved Godzilla more as an icon than I have any of his films (barring a select few), and the grand finale is the first time for me that the essence of the character was fully realised on screen. For that alone, I’m very grateful. One last non-sequitur: for the record (and your I.T. department), this is one of the slowest, most frustrating websites to try to post a response to that I have ever encountered. Submitted by HollywoodChicago.com on May 17, 2014 - 4:30pm. Thanks for the objective, two-sided reply. You seem to agree and disagree with me, but you hear me and I hear you. I appreciate debate like this.